"It pays to be an Army Musician"
"The Army performs a wide variety of musical genres alongside the opportunity for a full time, salaried career." Army musicians are paid to perform at famous, high-profile events in the UK and all over the world. 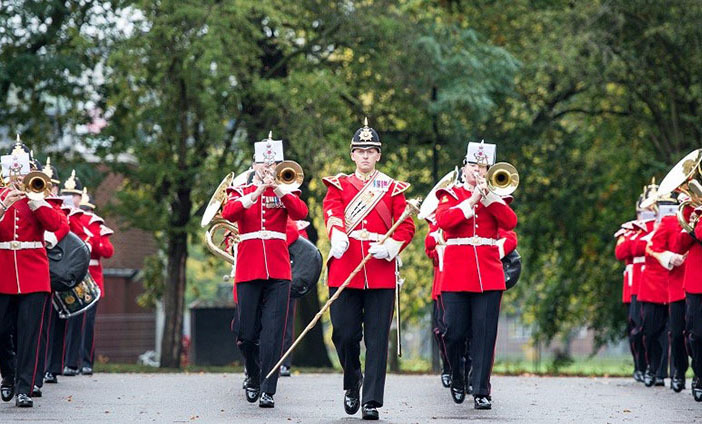 The Corps of Army Music is made up of 22 Regular and 19 Reserve bands that play everything from military marching music to jazz and contemporary, and needs musicians with a wide range of specialisms. Join us and you'll spend your days rehearsing and developing music for concerts and gigs alongside like-minded people. Play alongside some of the world's best musicians in one of our 22 Regular or 19 Reserve Army bands based throughout the UK. Travel worldwide performing at venues and arenas. Enjoy a structured career up to the age of 55 with the chance to gain promotion. Combine a love of music with the sport and adventurous training the Army offers. Have a full-time salaried and pensionable career as a professional musician. All standard Army entrance requirements. Once you’ve joined, you can get qualifications in performance, conducting and more. BTEC Level 2 Qualification in Music. Associate Trinity College London (ATCL) Diploma in Music Performance. Licentiate of the Royal Schools of Music (LRSM) Diploma in Musical Direction. Earn £15,230 during training. When your Initial training is finished, and you join your unit as a Musician your pay will rise to £18,859. You’ll get paid a day rate according to your rank, starting from £37.47 in training and rising to £46.42 per day once you’re a Private. This includes being paid for weekly drill nights. Plus, if you complete all of your annual training days, you’re entitled to a tax-free lump sum called a bounty. Your basic training takes place over a series of evening, weekend and residential courses. Once your online application has been approved, you'll meet with a local recruiter. This is your chance to tell us about the role that you're interested in. You'll also be expected to audition to see if you have the musical ability needed to join the Corps of Army Music.